The PromenAid grab bar is a new innovation in grab bars that can be installed as a grab bar or as a handrail for walking and standing support anywhere in the home or commercial application. 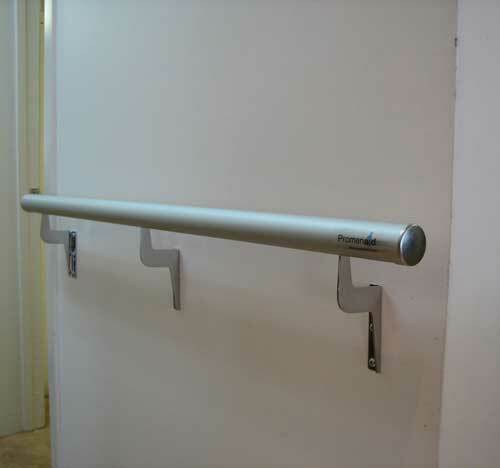 Conventional grab bars and handrails are sold in a variety of standard lengths and the user has to compromise between what will install properly in their situation and what will work best for them. This continuous handrail is available in a variety of standard lengths or can be cut to a custom length as required. 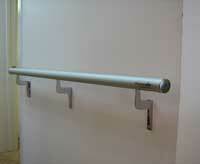 Cutting of the PromenAid handrail can be done at the factory or on site by the installer. 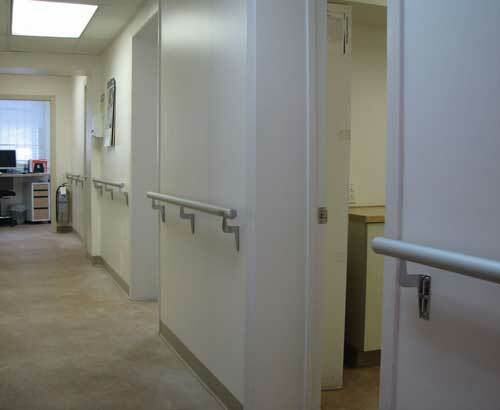 Regardless of the length of the bar, the installer can easily adjust the position of the mounting brackets to where the wall's studs are located and is not limited to the predetermined spacing on conventional grab bars or railings. The hard anodized finish is beautiful and scratch-resistant extruded aluminum handrail tubing is sold by the inch or in standard lengths. The handrail is reinforced with internal ribbing and is 1.5" (4cm) in diameter with a continuous underside recess designed to secure brackets at any point along its length. 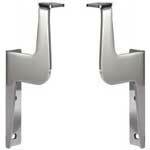 PromenAid polished stainless steel brackets are made of stainless steel and polished to a mirror finish. They clip securely and easily into the handrail tube at any convenient point. The minimum recommended spacing between brackets is 32 inches. The wall brackets are formed to provide 1-1/2� [38mm] clear space between railings and walls, and designed to twist-lock into the continuous recess under the handrail at any point along its length. Contact surfaces with walls shall allow for three fasteners. 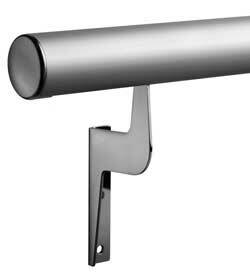 In order to better conceal the mounting screws used to install this PromenAid handrail on the wall, the wall brackets are manufactured in both left and right hand designs. PromenAid end caps are easily secured to the handrail with a supplied set screw to provide an elegant finished look to the handrails. The end caps are made of die cast zinc and have a triple-plated matte chrome finish.